Der Artikel Baby I've Got It! 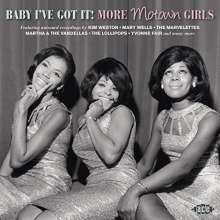 : More Motown Girls wurde in den Warenkorb gelegt. Many moons have passed since our last »Motown Girls« project was released – but these things take time and a great deal of patience. We’re confident followers of the series will find this new volume well worth the wait. The collection opens with ›In My Heart I Know It’s Right‹, the first song Gladys Knight & the Pips recorded for Motown, and closes with the great Kim Weston in torch singer mode. In between you’ll find some of the company’s biggest stars – the Marvelettes, Brenda Holloway, Martha & the Vandellas – alongside lesser-known collector’s favourites such as Liz Lands and LaBrenda Ben.